Zoo Lunchies Review And Giveaway!!! CLOSED!!! I have got the cutest little lunch bag to give away! I got one for my daughter and she just cant wait to use it for school. It is called a Zoo Lunchie from Skip Hop. 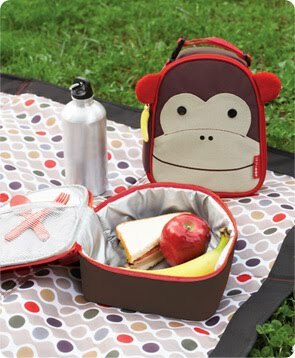 These little lunch bags are just too cute. They look like little animals. If you head over to Skip Hop you can view all the different bags they have from the Mouse to the Bee. One of the features I love best about them is that they are PVC , Phthalate and BPA free so you dont have to worry about any of those nasty chemicals getting into your kids food. They are so roomy and can be wiped clean. These dont just have to be for kids, moms on the go can use them to store bottles and food for their babies and toddlers. I will be giving one lucky reader a Mouse Zoo Lunchie! To enter just follow this blog publicly on Google Friends Connect! Giveaway will end on September 8, 2010 at midnight. Open to US residents only. Winner will be chosen at random and will be given 72 hours before another winner is chosen. 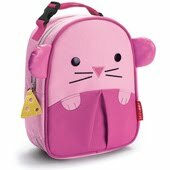 Previous Post Old Navy and Toys R Us: Get a free lunch kit with the purchase of a backpack!! So cute!! I follow your blog! How cute! I'm a follower! This is too cute! I follow publicly!MeganMommyminded@gmail.comMommyminded.blogspot.comWin a $25 Target GC! Those are adorable. I follow via GFC! cute i love the monkey! following from Little mama's nestwork! So cute, I'm 41 and a student and I would love one of these for ME!Am following you, found you on Nestworks.Am also following you on Twitter. These are so cute! I would love to be entered! I am also your newest follower! Thanks for finding me at momondealz. I am subscribing to your blog! These luch boxes are too cute! Following!home at thelucaszoo dot comThanks!